This little beauty is a great addition to your bug-killing arsenal. Shaped like a tennis racquet, it uses an electrical current to fry whatever flying insect comes in contact with its wires. There is a loud crackling/popping sound when the enemy is zapped, which I can only assume is sadistically satisfying to a lot of people (not that I would know this personally), especially if said sadist is already itching from bug bites and wants revenge. Yes, I am a fan. For one thing, it feels better to actively attack mosquitos this way, rather than spraying bug spray on myself or lighting a wenxiang and hoping it keeps them away. For another, it seems like we get a higher kill rate than just trying to clap them with our bare hands. You also don’t need to wipe goopy bug guts off your palms when you succeed in killing one. 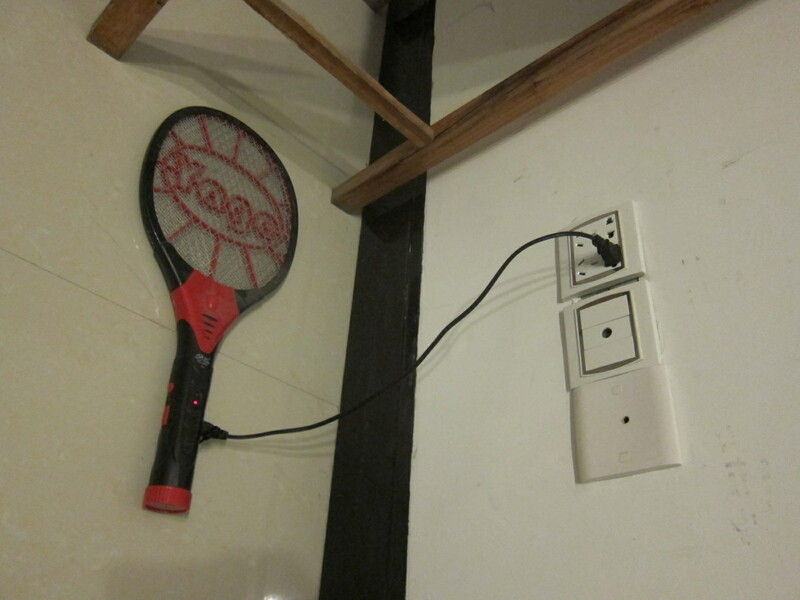 Our previous mosquito racquet had a fold-out plug for recharging. 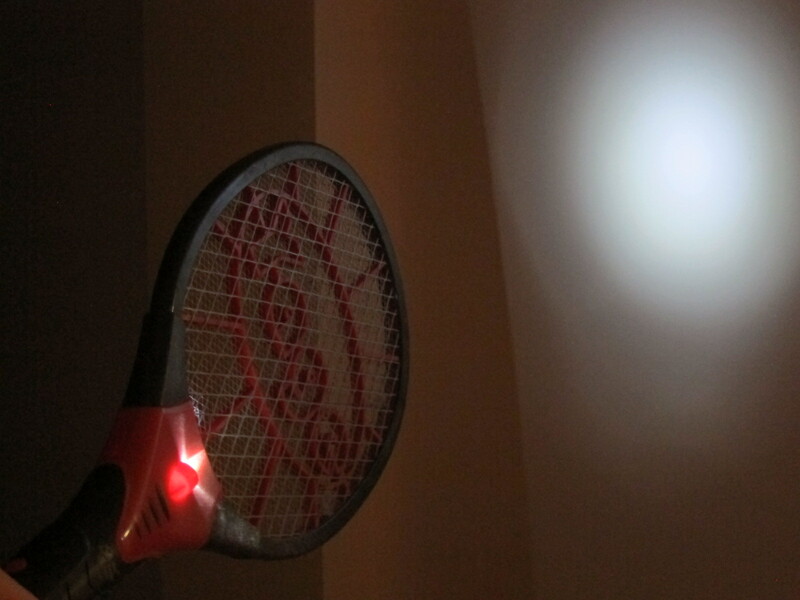 It sounded convenient, but it meant plugging the entire racquet into a wall. Given that outlets are usually few in number – and often in odd locations – in small town Chinese homes, it makes it bu fangbian to figure out how to have one of these plugged in. Plus, it seems somewhat dangerous to have this thing hanging just by its plug from your wall. If Fluffy comes by and bumps it… Anyway, I recommend getting one with replaceable batteries or a separate charging cable instead. Our current model has three modes: off, on, and on with flashlight. Yes, it really does have a little flashlight built into it. My guess is that it’s supposed to help you locate mosquitos in the dark, but it seems to be more effective and straightforward to just turn on the lights in the room if you need to hunt a bloodsucker in the middle of the night. (Sorry, all you would-be Stealth Commandos.) I would not recommend going out of your way, or paying extra money, to get one with the flashlight feature. Do remember to handle these carefully and keep them out of little hands. 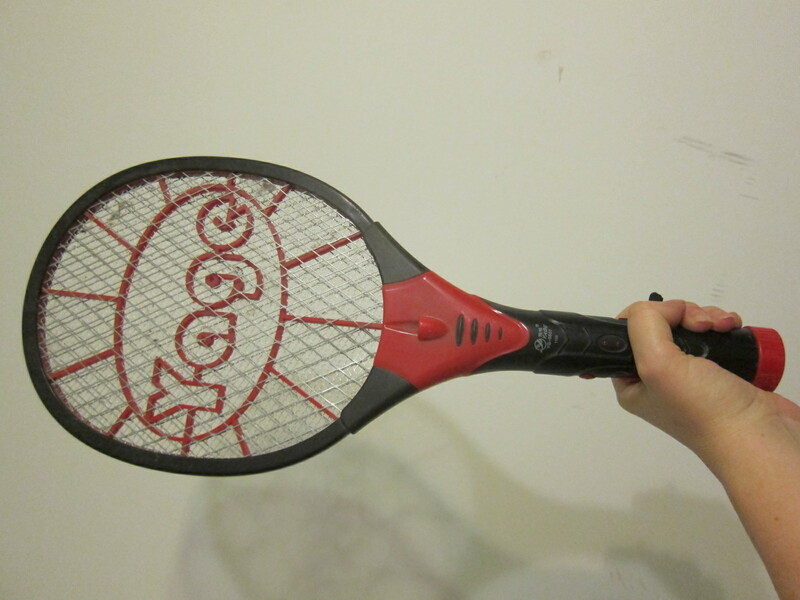 I’m sure plenty of 8-year-old boys could think of creative uses for an electrified tennis racquet.